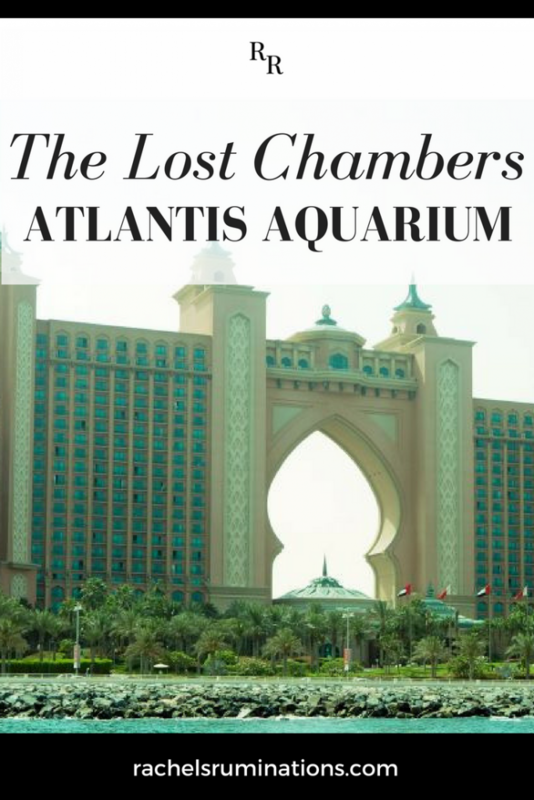 The Lost Chambers Aquarium at Dubai’s Atlantis the Palm Dubai hotel is not your run-of-the mill aquarium. At any self-respecting large aquarium – think the Monterey Bay Aquarium or the Boston aquarium – you’d expect to see a range of species from all over the world. The Lost Chambers has that. It isn’t a big aquarium, but some of the tanks are huge. It claims to house 65,000 creatures in a variety of habitats including a large “Ambassador Lagoon” with sharks, rays, and other large species; a jellyfish tank; some coral reef tanks; and a lobster tank, among others. 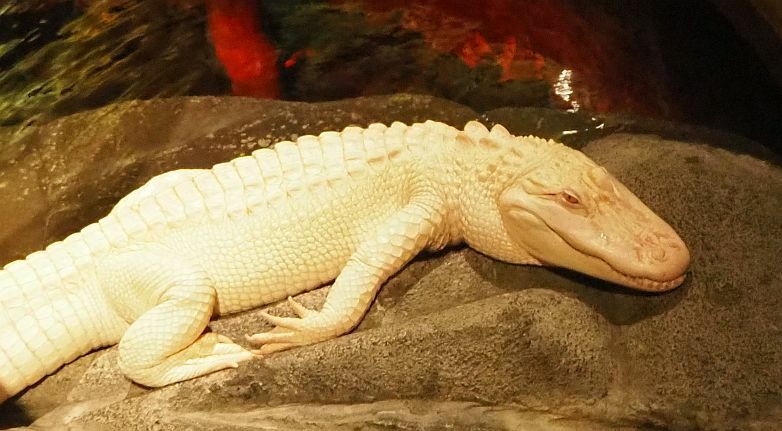 It even has two white (albino) alligators. You’d also expect to see an emphasis on education, with information delivered in the form of signs identifying each tank’s inhabitants and other exhibits teaching about issues like ecosystems, pollution, tidal life, etc. The Lost Chambers has an educational component, with a tablet next to each tank where visitors can look up particular sea creatures. An app on a smartphone uses Bluetooth to sense where you are, and you can look up information or play games. What’s different about this aquarium, though, is its theme. 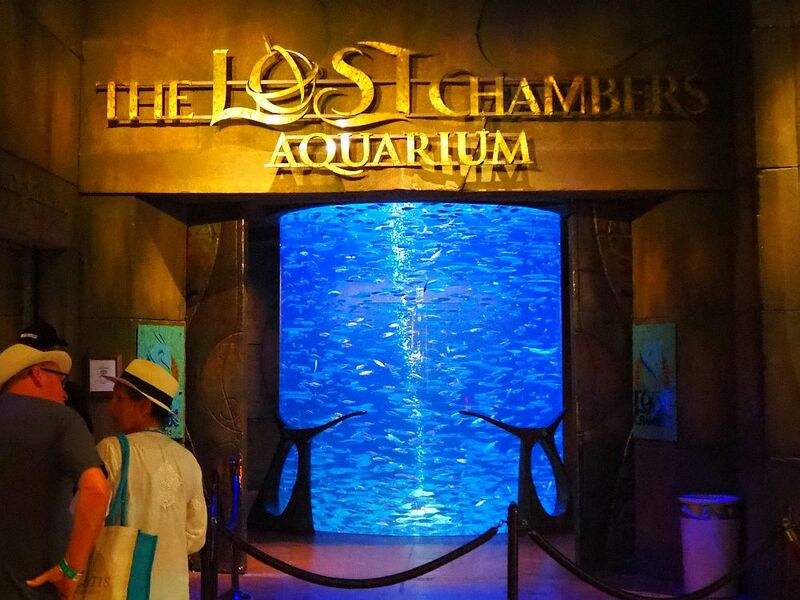 Keep in mind that the aquarium is in the Atlantis the Palm Dubai hotel. 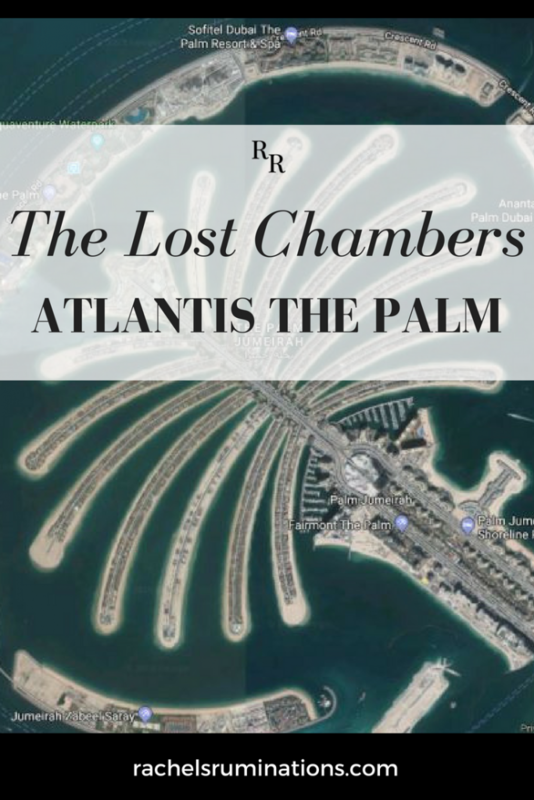 Its name, “The Lost Chambers,” is intended to evoke the Atlantis legend, of an island that sank into the sea. When you think about it, is a sinking island a good image for a hotel that sits on an artificial island? A visit to this Atlantis aquarium is clearly much more about atmosphere than education. The largest tank, the “Ambassador Lagoon” (11 million liters), houses 250 species and, as at any aquarium, there’s a certain hypnotic effect to watching the rays, sharks and fish lazily circle through the blue water. The tanks include, though, “ruins and artefacts from ancient Atlantis.” That’s a quote from the aquarium’s leaflet, but it doesn’t have the quotation marks in the leaflet. It’s presented as fact. 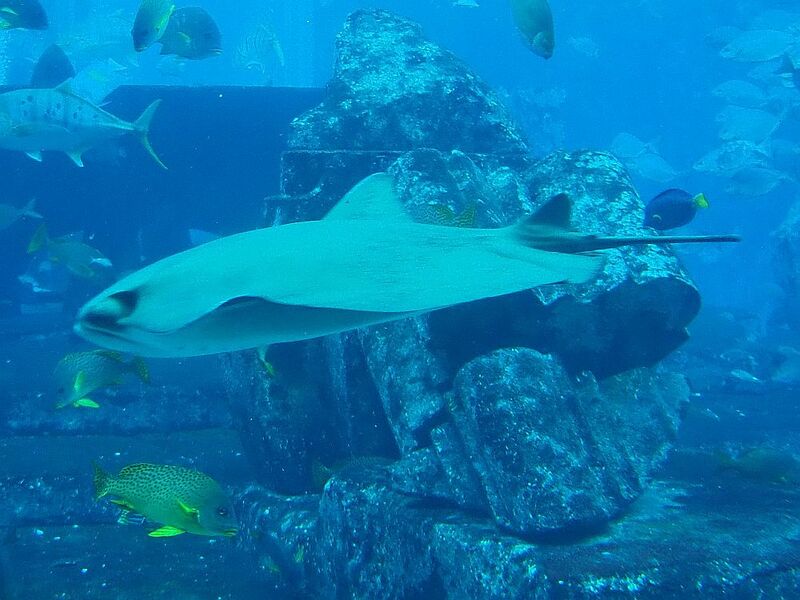 A large ray glides past the “ruins of Atlantis” in the Ambassador Lagoon. Anyway, what struck me most about this aquarium was not the fish tanks. It was the large hallways around and between tanks. They are decorated in a strange blending of ancient classical civilization accents with vaguely steampunk elements. This “lost Atlantis” aquarium resembles bad old sci-fi films, Jules Verne’s 20,000 Leagues under the Sea, and new age mumbo-jumbo all rolled into one … with a bit of Star Trek thrown in. 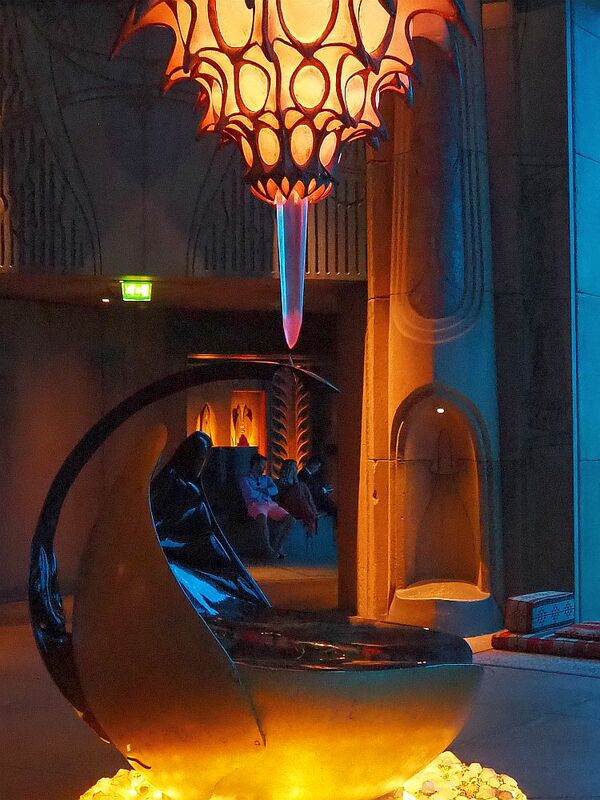 One hall, the Seven Sage Chamber, has as its centerpiece a large something-or-other: a pod, maybe? A seat? I couldn’t tell what it represents. Round, more or less, it is a couple of meters across, metallic, but with seemingly organic curves. It doesn’t seem to serve any purpose. Above it, a chandelier of sorts emits a weak, yellow glow. This photo shows the round object below and the chandelier above. In this room are the remains of an organic computer. The Sages came to this chamber to upload data from their exploration and research programmes. When the King needed to retrieve information a virtual screen would appear while the seven sages would sit around the room and give explanations of their work. The app would be useful for looking up the marine animals on display; for each one you can find out its scientific name and a few interesting facts about it. There’s not much more than that, and the app doesn’t include all of the species the aquarium claims to contain, nor does it include information about habitats, ecosystems, or other more general topics. In any case, I find the dry combination of fantasy and fact, all presented as fact, disturbing somehow. 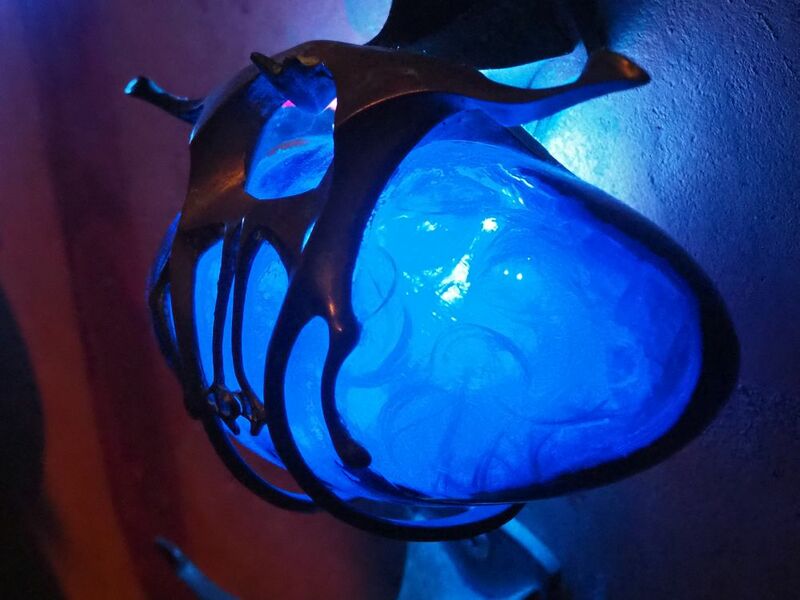 In this chamber the Atlanteans would conduct their business affairs, depositing or withdrawing blue crystals which was standard Atlantean currency. Given that each of these “crystals” is only a bit smaller than a soccer ball, they strike me as an awkward form of money. How big were the Atlanteans’ pockets? In another open space, two niches, dramatically backlit, display what look like two old-fashioned scuba diving suits, or rather a steampunk version of them. Somehow they reminded me of the Creature from the Black Lagoon. This room is called The Abyss, and, according to the informative app, the room was used by the Atlanteans for mining, looking for the crystal that was their main source of energy. 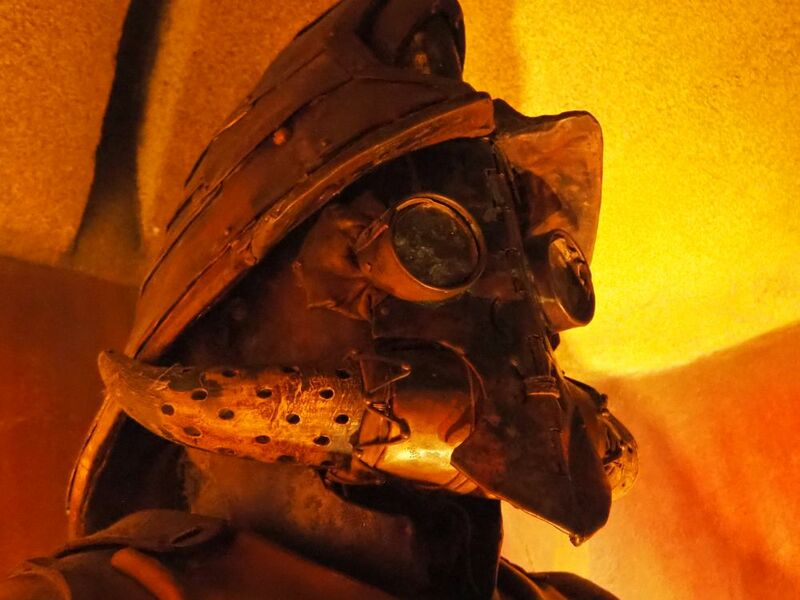 They would wear the suits, the app explains, to descend down the mine shaft, an ornate structure in the center of the room, to search for treasure. In another hall, the “Navigation Room,” the app even mentions a teleporter. Combine that with the crystals for energy (dilithium, perhaps?) and the Star Trek link is complete. Throughout the aquarium, I came upon more such oddities, mostly in a metal that may have been bronze, though it was hard to tell in the dimness. You can take a tour of the aquarium, including a visit behind the scenes to see how it operates. The aquarium’s publicity material says that on the “Fish Tales Tour” you’ll “learn about the myth and marine life of the ancient lost city of Atlantis.” Again that suspicious blending of fact and fiction. I guess you can tell that I wasn’t wonderfully impressed, as far as aquariums go, though I enjoyed my short visit well enough. While I was distracted from the marine life on display by the bizarre décor, I seemed to be the only person there taking the time to look at any of it. Most of the other visitors were families with children, and they showed far more interest in the fish than anything else. If the designer’s intent was to create a new theme park with a new legend to go with it, I think he or she missed the mark a bit. This Atlantis aquarium makes up part of a small mall attached to the Atlantis the Palm Dubai Hotel, a five-star confection at the outer end of Palm Island. I took this picture when I took the Yellow Boat tour of Dubai. I tried the same trick I’ve used in other high-end hotel lobbies: I just walk in like I own the place. Generally no one challenges me – yes, I realize that it’s because I’m a white, middle-aged woman – and I get to wander around the public parts of the hotel, take the elevator up to see if there’s a view, or check out the pool. This time, it didn’t work: guards make sure that no one who doesn’t have a room key can venture any further into the hotel itself. I would love to see the hotel’s undoubtedly opulent lobby. I’d love even more a peek into its fanciest room, the Royal Bridge Suite. Spanning the whole top of the hotel’s massive archway, the suite is 924 square meters and includes three en-suite bedrooms and a team of servants. It starts at over €10,000 per night (over $11,700). Two underwater suites looking out on the Ambassador Lagoon start at “only” €2800 per night (about $3300). I did get to enjoy a ride in the Palm’s brand new monorail. When I visited in April 2018, the line had been completed and opened but several of the stations weren’t yet in use. Boarding outside the aquarium, I could see Aquaventure Water Park, the Atlantis The Palm Dubai Hotel, and a great view of the Dubai skyline from the driverless monorail train. 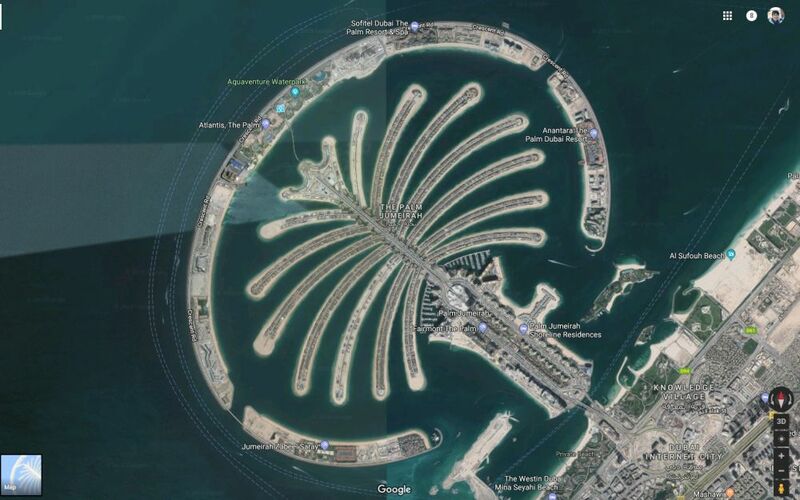 It also gave me a quick glimpse down at some of the residential housing in The Palm along its Fronds – the name used for the streets within the man-made island complex. Because it’s driverless, you can look straight out the front of the monorail, which gives a great view of the city as you leave the Palm. 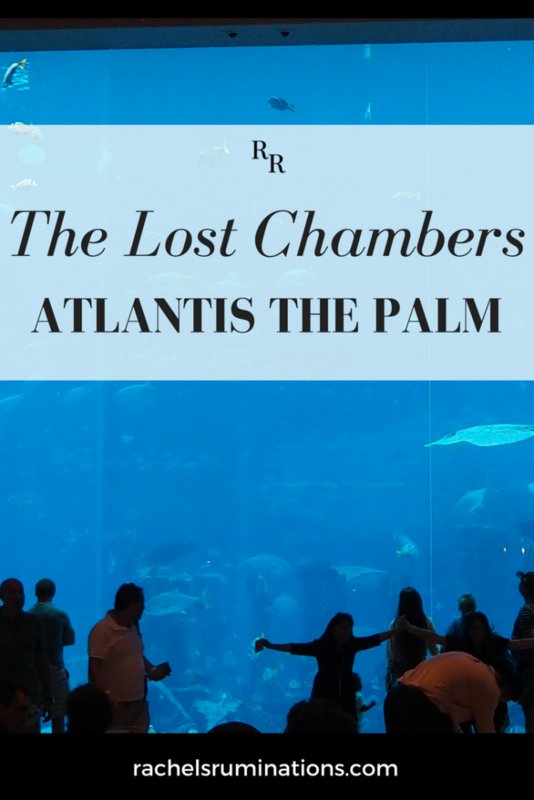 The Lost Chambers at Atlantis the Palm. Open daily 10-22:00. Admission AED115 (€26 or $31). The Lost Chambers also offers various special experiences, for an extra price, of course. I did not do any of these activities so I cannot vouch for their quality, and I don’t know if they’re worth their very high cost. Hatha yoga sessions take place every Tuesday and Friday morning at 8-9:00 for AED125 (€29 or $34), including bottled water and yoga mats. You can snorkel in the largest tank, starting at 310AED (€72 or $85), mask, snorkel, wetsuit and towel provided. Atlantis Aqua Trek involves walking in the largest tank on a 3-meter-deep ledge using a special helmet. This costs AED620 (€144 or $169). A scuba diving package that doesn’t require any experience costs AED1320 (€305 or $359). If you’re a certified diver, you can take a 30-minute dive for AED1095 (€254 or $298) or a night dive, including hand-feeding the sharks, for AED2,650 (€613 or $722). Next door to the aquarium is a water park called Aquaventures. I didn’t visit it, but I’m sure its water slides would be a hit with kids in the heat of Dubai. Stay away from the activities it offers that are not animal-friendly, like the dolphin shows or swimming with sharks. And be careful of sunburn! To get there, you can take a taxi or you can take the monorail. 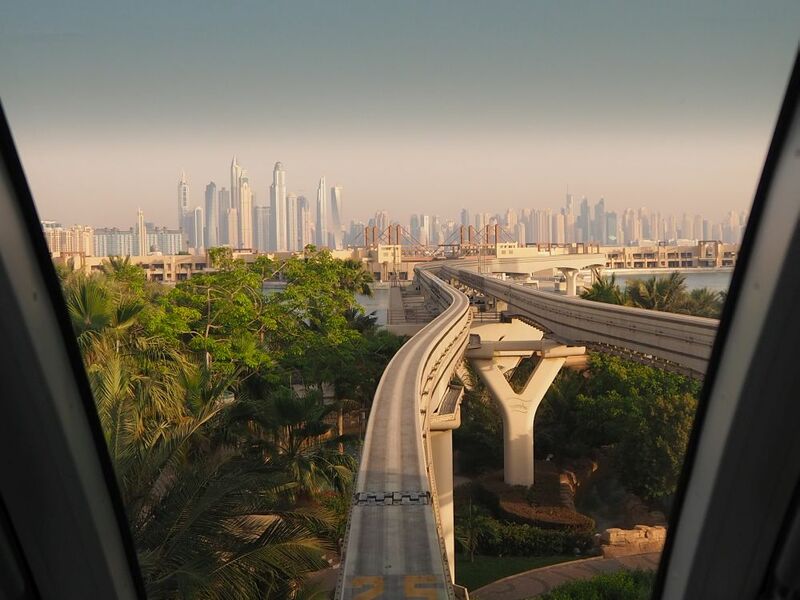 To get to the monorail, get off at the DAMAC Properties or Jumeirah Lakes Towers metro station (prices vary depending on where you are traveling from). 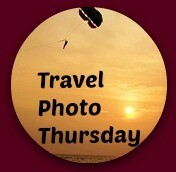 Next, walk to the tram station and take the tram to the Palm Jumeirah stop. The price also depends on where you get on, and what sort of transportation card you have. Use the same card that you use for the metro. At the Palm Jumeirah stop, you’ll have to follow the signs that will lead you up and across a large street on a bridge, then through a parking garage to the monorail station. Perhaps when the monorail station is complete the walk through the parking garage will be replaced by a dedicated walkway of some sort. This is the end of the monorail line, so board here and take it to the Atlantis station. 20AED one way (€4.60 or $5.50), 30AED (€7 or $8) round trip. If you liked this article, please share it. The images below are perfect for pinning! 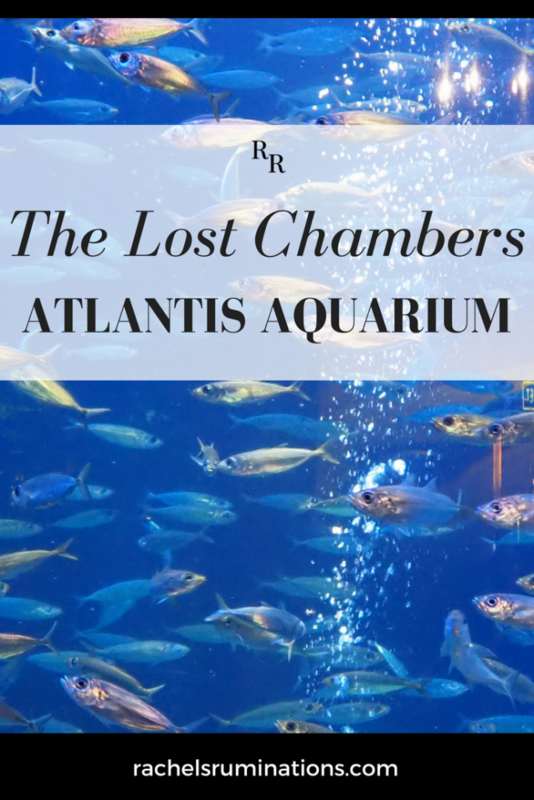 As you said, you were distracted by the bizarre décor and didn’t enjoy the marine life displayed in the Lost Chambers Atlantis Aquarium to the fullest, I would recommend you to visit it once again. But this time, just pay attention to the marine species. I am sure you will enjoy your trip. I have been to the Aquarium twice in 2015 and 2017. Yet, I feel like exploring it again. I didn’t mean to imply that I didn’t enjoy it; I was just a bit puzzled. Next time I’m in Dubai (September) I’m going to visit the competing aquarium in the Dubai Mall. That way I can make a fair recommendation of which one to do if you don’t have time for both. This post explains so much. My family visited the Atlantis Resort in the Bahamas last spring and the two are siblings. Much is the same but Dubai’s looks newer. You’ve inspired me to compare the two one day. I just loved the archeological references. I heard that there was one in the Bahamas. Apparently they’re building another one in Dubai that’ll be the biggest just because they want to have the biggest Atlantis resort in the world. This place looks so cool!!!!! I love the Atlantis theme, it’s so unique and makes it a fascinating experience. I’ll definitely be adding this place to my list for when I finally make it to Dubai! Go for it! Plenty of other articles here on the website about other things to see in Dubai too! I have stopped looking at aquariums after n times so this one I will definitely not go to! Have you stopped just out of lack of interest or on principle or something else? The interior design looks almost as interesting as the inhabitants of the aquarium. Looks like a must-see when in Dubai. Atlantis is building a huge new hotel and aquarium at KoOlina on the Hawaiian Island of O’ahu, where our timeshare is located. Many have been pondering if this would be a plus or minus, but this makes me think it will definitely be a plus. . .of course if the hotel is that big we’ll need a whole new road and traffic signal system. I have no idea whether it would be a good or bad thing. I can say that the hotel is absolutely huge! What a bizarre place. In fact, all of Dubai seems like a bizarre place. I’ve only been in the airport, and even that seemed kind of bizarre—-the Irish Pub next to the Men’s and Women’s Mosques, the African laborers sleeping on the floor, while their Indian supervisors filled the Business class lounge. If I ever get to return, I’ll make sure to have time to leave the airport. It definitely is a bizarre place! And contradictory in so many ways! Yes, security in Dubai is certainly much tighter than I’ve experienced elsewhere. We pulled up to the parking guard at the Burj Al Arab and I stated I was a travel writer and just wanted to haver a look around. We were refused entry onto the grounds, as we did not have an appointment! That’s the first time that has happened to me! I would like to go and check out everything at Atlantis. They were just building it when I was last in Dubai. I tried the same thing once. They don’t let anyone into the Burj Al Arab grounds who isn’t a guest in some way. Which was why I think it was worth it to do the tea thing; it let us get into the grounds and wander around freely. 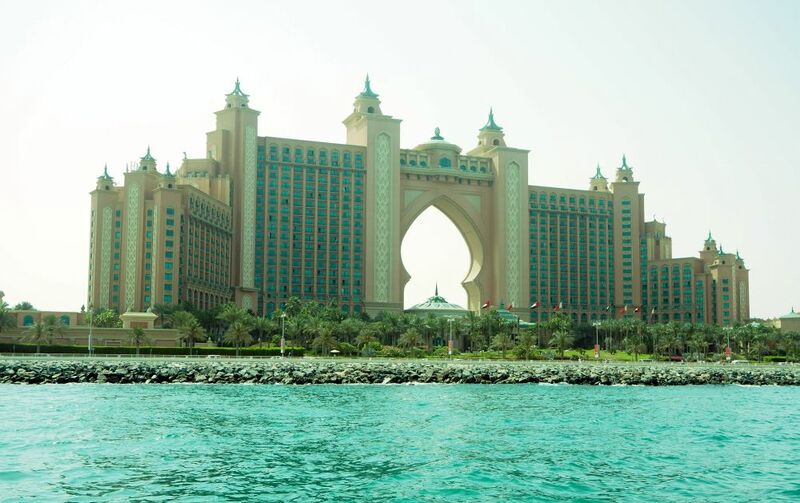 If you’re going to try to see more of the Atlantis the Palm, I’d make a reservation ahead of time! I am a huge fan of aquariums and have written about several on my own website so I was interested to read about this one in Dubai. After reading your post, I have to say I don’t think I would go out of my way to visit it. It did seem rather bizarre, like they were perhaps making up their own science fiction about the “lost world” of Atlantis in the puzzling exhibits you mentioned. I really have not had a desire to go to Dubai and am surprised that so many travel writers I know seem to make it there. Is it a stop over on the way to or from other popular destinations? Yes, for some people it’s a stopover, for example if you’re traveling on Emirates between Europe and Asia or Australia. For me it’s because sometimes I get sent there to lead workshops. As a matter of fact, I’ll be back there again in September. And some people go there for an easy short holiday: fancy hotels, nice beach, lots of shopping. I also enjoyed my stay at the Dubai Atlantis. Loved the Aquarium and the behind the scenes tour of the aquarium. I have a number of stories and photos on my site about my week in Dubai. As a matter of fact i quite enjoyed the decor, being a fan of some of “bad” old sci-fi flicks) To say more, i was quite fascinated, and appreciated the fair amount of effort the designer put into it. For me the aesthetic comes closest to Star Gate and this is supposedly what it was intended to. I would love to know who the designing team was. They are worthy of praise!